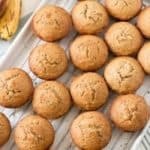 Gluten Free Banana Muffins made with a whole grain flour blend. They are also dairy free, refined sugar free, and a great source of protein and fiber! 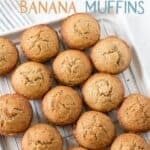 Creating a recipe for healthy gluten free banana muffins has been on my mind lately. I’ve been looking to get more whole grains into my diet and I always seem to have over-ripe bananas on hand. If you follow me on Instagram, you may have seen that I scored some sorghum flour on clearance recently! Woot! All this led to me creating a whole grain flour blend and some healthy banana muffins that just so happen to be refined sugar free and dairy free! 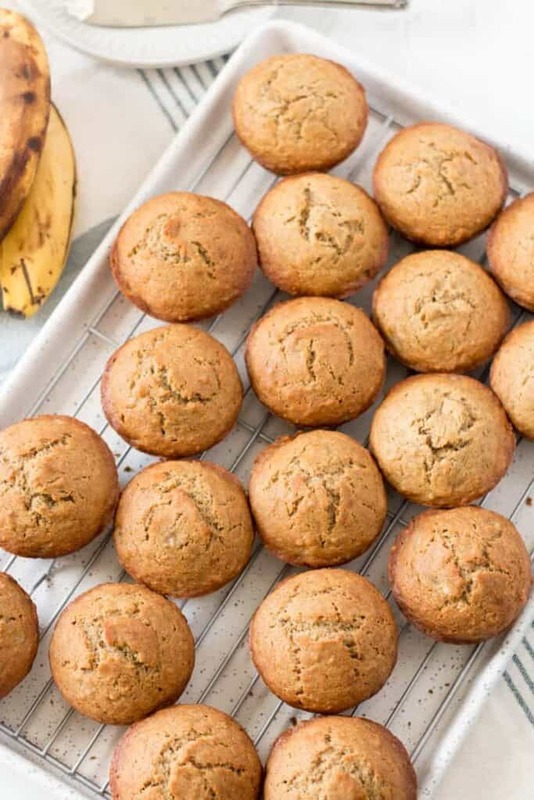 I have made healthy banana muffins before, but I feel like this version is next level healthy. They’re not only a great source of whole grains, but also fiber and protein! If you’re wondering if such a healthy muffin could also be tasty, I offer my gluten-eating teenage son as evidence. He ate so many of these muffins, there is no doubt in my mind that they are a great tasting muffin. One problem with the gluten-free diet is that you have to try a little harder to get whole grains. Whole grains are really good for you and are shown to reduce cardiovascular risk, but when you can’t eat the most accessible whole grain (wheat), you have to get creative! Luckily there are plenty of whole grains that are also gluten-free! It’s great that we have gluten-free whole grain options, but to utilize them usually means making a flour blend ourselves. This is a great article on how to make a gluten-free whole grain flour blend. I followed those tips to make my flour blend. The basic ratio for the blend is 70% whole grain flour with 30% starches. I chose Brown Rice flour and Sorghum flour as my whole grains and Potato Starch and Tapioca flour as my starches, mostly because that’s what I had on hand. Then shake the container really well to combine the flour. Easy, peasy! Pro-tip: If you’re living a gluten-free lifestyle, invest in a digital kitchen scale! You’ll be surprised how often it comes in handy! 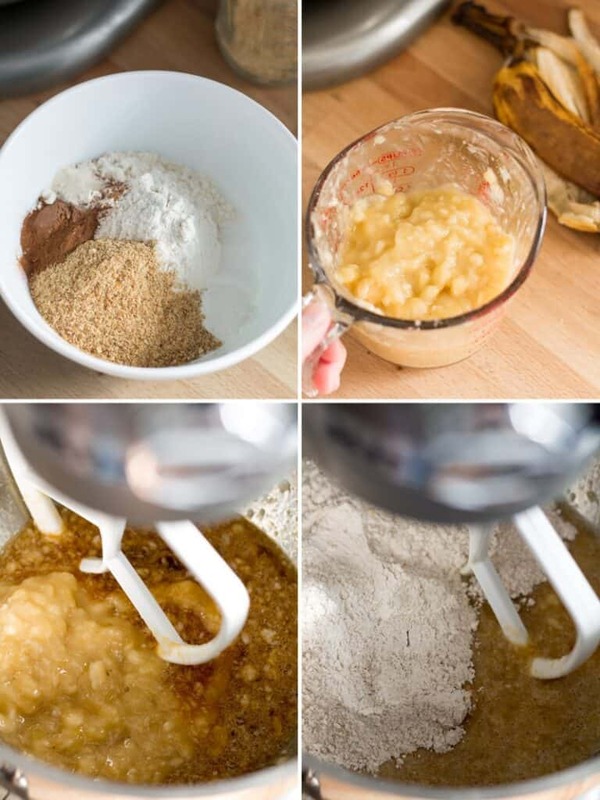 With the flour blend on hand, we’re on to muffin making! It’s standard muffin operating procedure from here on out! Whole grain gluten free flour blend with sorghum and brown rice flour. Flaxseed meal for extra nutrition and fiber. Xanthan Gum for extra structure since our blend does not already contain it. Then mash the banana. We need about 1 cup of mashed banana, which for me was three small bananas. Maple syrup to sweeten the muffins, a healthier choice than white or brown sugar. Coconut oil instead of butter to keep them dairy free. Then mix the dry ingredients into the wet ingredients. Done and done. The batter is thick and rich in color. 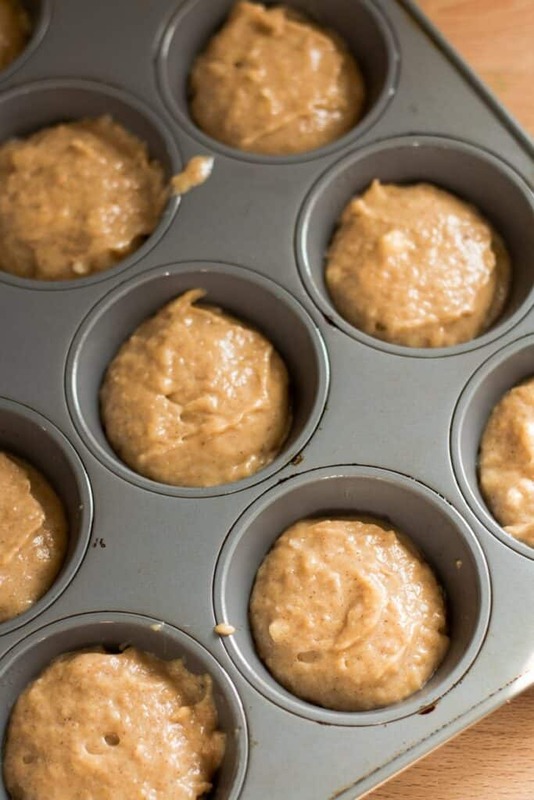 It looks just like any other banana muffin batter but you’d never guess how much healthy goodness is packed inside! 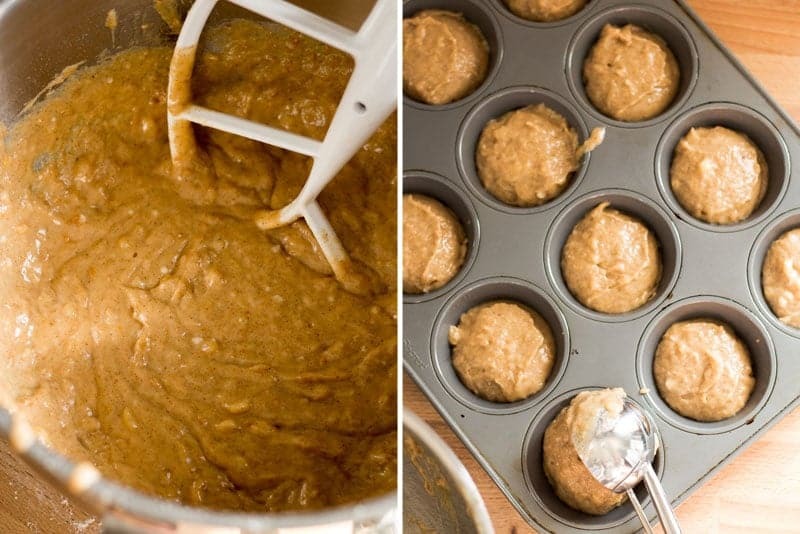 Just scoop the batter out into greased, standard-size muffin tins and bake! Bake the muffins at 375°F for 15-17 minutes. You’ll know they’re done when the tops spring back when touched and a toothpick inserted in the center will come out clean. Try not to over bake them! 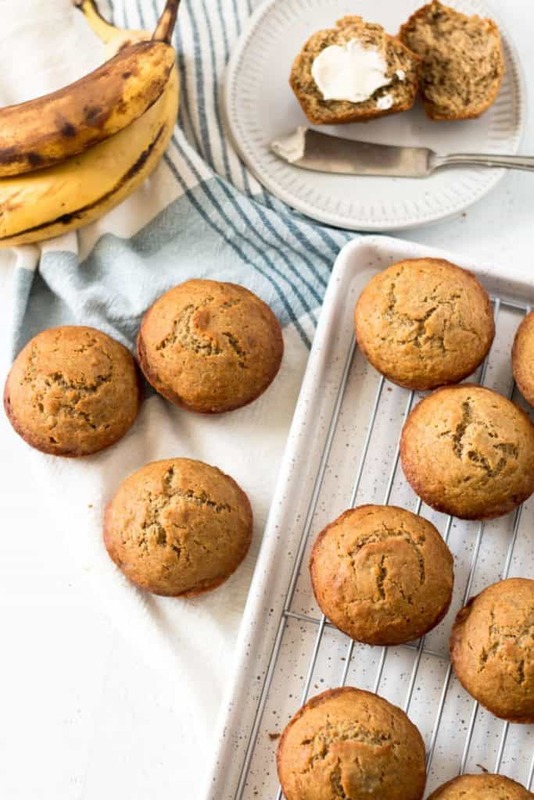 With this perfectly moist, gluten-free banana muffin recipe, sweetened with maple syrup, full of whole grains, protein, and fiber, you won’t feel any shame eating one or two for breakfast. In fact, it might just be a good for you! 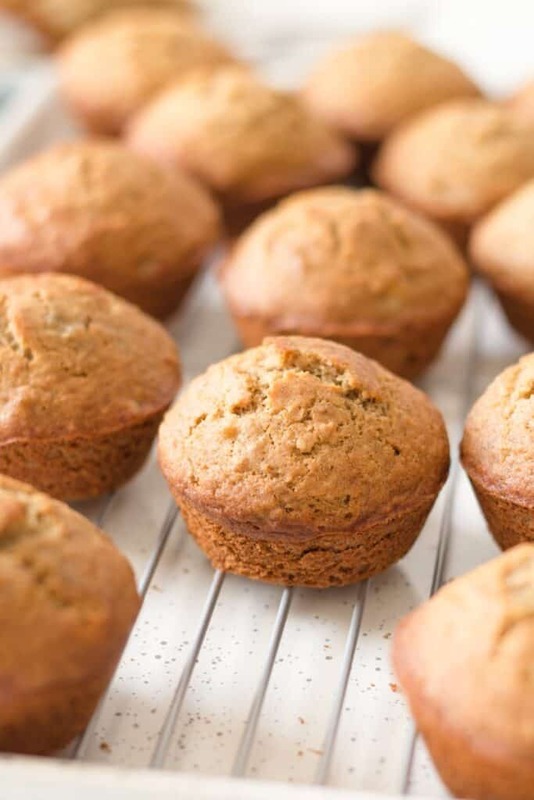 Whole Grain Gluten Free Banana Muffins are dairy free, have no refined sugar, and are still moist and delicious! Heat oven to 375°F. Grease standard 12-cup muffin tin. In a separate bowl, blend the wet ingredients. Scoop 1/4 cup batter into each muffin tin. Bake for 15-17 min. Mix well in large container. Makes enough for several batches of muffins. These look so good. And you’ve done all the work of figuring out which flours and starch to use. Nice job! !